This article is about actual bubbles. For other uses of the term "bubble", see Bubble (disambiguation). Bubbles are floating objects that appear throughout the Mario franchise of games. Bubbles sometimes have contents within them, and bubbles can be ridden inside in some games. Some bubbles also replenish the air meter if Mario or Luigi is underwater. Bubbles first appear in Super Mario World, where they can be found floating around in a few levels. Bubbles contain either power-ups, Bob-ombs, Goombas, or Cheep Cheeps. Simply touching one causes it to burst, with whatever in it falling down. Large green bubbles also appear as obstacles in Vanilla Ghost House. In the Hippo stage, the titular Hippo blows bubbles that allow Mario to "swim" in air, allowing him to reach the entrance to the Space Zone. They pop when they touch water or an enemy - in the latter case, a powered-up Mario briefly flashes between his large and small Mario sprites as if he has taken damage, but will not lose his current power-up (e.g., Fire Mario does not become Super Mario). Bubbles can be found in the underwater levels of Super Mario 64 and Super Mario 64 DS. They usually appear when Mario opens a treasure chest underwater, and contain oxygen that refills his Health Meter. The only place in Super Mario Sunshine where Mario can use bubbles is Noki Bay when he dives to see Eely-Mouth. There Eely-Mouth spews forth toxic bubbles. If Mario were to squirt the toxic bubbles long enough, they turn into breathable air, filling up Mario's air life meter. New to the Game Boy Advance remake of Super Mario Bros. 2 are big solid bubbles which hold 1-Up Mushrooms that can only be popped by throwing three Vegetables or enemies at them. Super Mario Advance 4: Super Mario Bros. 3 has two bubbles that can be found in the World-e levels Vegetable Volley and A Sky-High Adventure. The first one houses a Super Mushroom, and the second holds an Advance Coin; they work just as they do in Super Mario Advance. Bubbles also appear in New Super Mario Bros. They are found in water levels and they carry Coins. In Super Mario Galaxy, Bubbles have two roles. They can be found throughout underwater areas, and refill Mario or Luigi's oxygen meter if he touches one, much like in Super Mario 64. There are also Bubbles that can be found on land, which Mario or Luigi can enter and ride around in. The player must use the Wii Remote to aim the Bubble in the desired direction, blow it around by pressing , and leave the bubble by pressing . Originally, bubbles were going to be shaped like cubes. 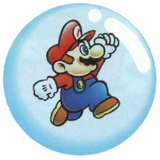 In New Super Mario Bros. Wii, if a player loses a life in Multiplayer Mode, he reappears in a bubble. The player can also go in a bubble by pressing or , giving themselves immunity. The player can shake the Wii remote to move closer to the other players. However, if all players end up in a bubble, they get sent back to the map screen and lose their power-ups, but they don't lose any lives. Some items are found in bubbles which allows them to float around the level. This is very common in Free Mode. Players can not bubble in Coin Battle mode. Each character makes cries for help (like "Help Me" and "Hey Help", etc.) that can be heard from the Wii Remote's speakers. There are bubbles that also appear in the underwater levels and they carry coins, just as in the game's DS predecessor. Also, in World 7-2, there are water bubbles, called Water Balls. Players can swim in them, and they also slow down Bullet Bills. They move in mid-air that the player can jump in. Once in one, the player can swim through it to continue onward. Bubbles reappear in Super Mario Galaxy 2, and serve the same function as they did previously, though in this game, Mario and Luigi can no longer ride around in bubbles at all, so they are used only for replenishing Mario or Luigi's air gauge when it gets too low. One minor difference in this game involves the Co-Star Luma being able to physically fetch air bubbles that are far away from the player, and then bring them to the player. Peach is also shown to be trapped inside a Bubble before the final boss. In New Super Mario Bros. 2, bubbles have the same function they did in New Super Mario Bros. Wii. They are entered by pressing a special button on the Nintendo 3DS' touch screen. A player in a bubble can approach the other by pressing . If the lead player goes too far off the other player's screen, the other automatically enters a bubble, as opposed to dying, which would have been the case in New Super Mario Bros. Wii. In New Super Mario Bros. U, bubbles reappear, functioning the same as in New Super Mario Bros. Wii. Bubble Baby Yoshis are also capable of shooting bubbles from their mouths, which can turn most enemies into Coins, power-ups or 1-Up Mushrooms. When the player gets a power-up from a Bubble Baby Yoshi's bubble, the order in which they appear is as follows: Mushroom, Fire Flower, Ice Flower, and Super Acorn. Water Balls from New Super Mario Bros. Wii appear again. In Super Mario 3D World, players are able to put themselves inside bubbles just like in the New Super Mario Bros. series, but unlike the New Super Mario Bros. series, the last player who is not inside the bubble cannot put themselves into the bubble. This marks the first time it can be done in a 3D Mario game. In Super Mario Run, bubbles serve as extra lives for the player, essentially replacing 1-Up Mushrooms. 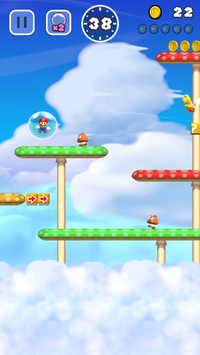 Unlike in previous games, they are not carried over between levels, as each level starts the player off with two bubbles. If the player is hit by an enemy in small form or falls into a pit, they reappear in a bubble and float to the left, allowing them to backtrack to a previous part of the level and retry once they pop the bubble by tapping the screen. If the player loses all of their bubbles, they lose the level and have to restart from the beginning. The player can also manually activate a bubble by tapping the bubble icon at the top left corner of the screen. Extra bubbles can be found in ? Blocks. In Super Mario Odyssey, when Mario falls into a pit while in Assist Mode, instead of resuming from the last checkpoint, he is carried back inside a bubble to the last stationary platform he was on, although he loses one hit point in the process. When falling off certain areas of the game, such as the concert stage during the New Donk City Festival and the Floating Island in the Luncheon Kingdom, he is placed in a bubble without losing any coins. Large bubbles appear in some underwater parts of the game and replenish Mario's air meter like in the Super Mario Galaxy games. When a Checkpoint Flag is touched underwater, it creates a bubble. In Paper Mario, the Bubble Plant in Flower Fields blows a Bubble if given a Bubble Berry. Mario and his partner can hop into the Bubble and travel past a sea of thorns. In Paper Mario: Color Splash, Mario and Huey are in a Bubble while playing Snifit or Whiffit. If Mario messes up four times (one time in the bonus rounds), a Big Urchin pops the Bubble, giving him an instant Game Over. In Super Mario Party, when the player uses a Buddy Phone or lands on an Ally Space, an ally comes in a bubble which pops upon touching the ground. In Super Mario World 2: Yoshi's Island and Yoshi's Island: Super Mario Advance 3, Bubbles have a number of roles. They sometimes house 1UPs, but usually appear in the form of Morph Bubbles. If the player is hit by an enemy, Baby Mario floats away in a Bubble. Bubble Dayzees and Barney Bubbles also spit out Bubbles as their attack method. These Bubbles cannot hurt a Yoshi directly, but are capable of knocking him back. Yoshis can also bounce up high after jumping onto these Bubbles. Bubbles appear throughout Yoshi's Island DS, and serve the same purpose as they do in the original Yoshi's Island. Bubbles appear in Yoshi's Woolly World, in the level Big Montgomery's Bubble Fort. Yoshi can bounce on top of them. Hook Guys can pop them with their sticks. Enemies can also sometimes be found in bubbles. Air Bubbles are used in Donkey Kong Country: Tropical Freeze to recover air while underwater. Generally, air bubbles sprout discretely from sunken diving helmets, and the Kongs can run into them to restore air. In some levels, such as Deep Keep, they also encounter clusters of tiny bubbles gushing out of sea sponge. These rising columns of bubbles have the same effect on the characters. Bubbles make an appearance in Baby Luigi's Eagle animation in the golf portion of the game, where, alongside Baby Luigi being in a bubble, various items, such as coins, Super Mushrooms, and Fire Flowers can be found in them, possibly referencing their appearances in bubbles in New Super Mario Bros. U. ↑ Super Mario Land 2: 6-tsu no Kinka Japanese instruction booklet, page 11. This page was last edited on April 18, 2019, at 13:02.